I luck out this morning, since I’m facing northwest as the Eurodam enters Hilo Bay early this morning. I have a perfect view of Mauna Kea as the Sun lights it up from the top down to sea level. The bonus is a Full Moon shining brightly above the sacred mountain with so many telescopes at the summit. Despite the early hour, I call my friends to come over to my verandah to share in the wonder. I setup my GoPro to capture a 4k time lapse video of the sublime view while I take still photos with my dSLR. The Eurodam slips into the dock and ties up while many are still asleep, however the Sun has risen and the day is warming. Eurodam arrival in Hilo at sunrise from JoeTourist on Vimeo. A mutual friend who lives on the Big Island picks us up at 11AM just outside the gate to the wharves, and gives us a beautiful lei to welcome us to Hawai’i in the traditional manner. 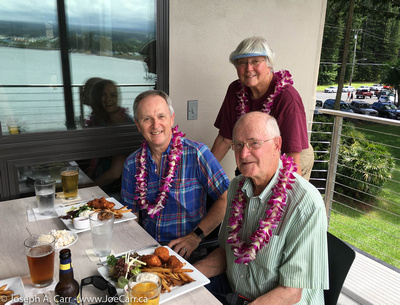 Our first stop is to have lunch at the Hilo Bay Cafe. Our table on the patio gives us a wonderful view of the bay while we have a beer and fish and chips as we catch up with each others’ lives. After lunch, we walk along the shoreline by the Lili’uokalani Gardens and over the foot bridge to have a look at Coconut Island. Since it is Saturday, there are lots of families enjoying picnics and swimming and paddling in the bay. We have a look at the tsunami flood levels marked on a coconut tree, which illustrates just how high the water level has risen in past years within the shallow bay. We decide to go see the Hawaii Tropical Botanical Garden, which is along the coast just outside Hilo. It is quite a hike down to sea level and then back up the hill to the parking lot, however the foliage, spectacular flowers along the walls of the gulley are breathtaking. I remember this spot from my previous visits, however I used the public access to the shoreline, so missed the best parts. We return to the ship by 4PM and sail out of Hilo Bay at 6PM, on our way to Honolulu tomorrow. This entry was posted in Hawaii and tagged cruise, cruise ship, flowers, island. Bookmark the permalink.